The 300-level research seminar course was designed to allow students to take ownership of their learning through knowledge creation, and to explore the nature of the humanities in the digital age. 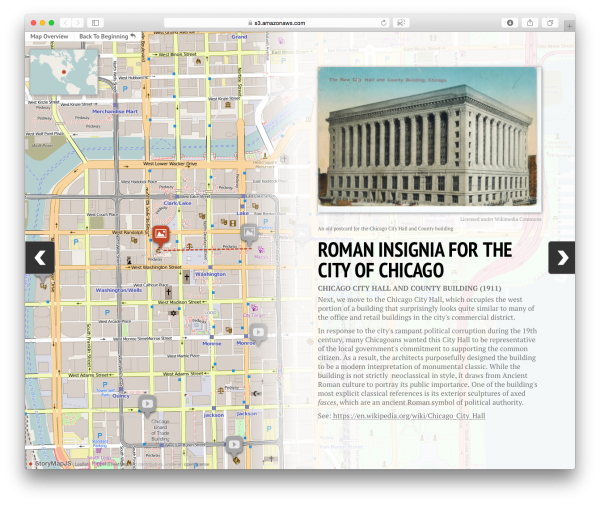 To complete their research and scholarship, students used a variety of supporting tools to create the walking tour including the video equipment and software of the MMLC and StoryMapJS from the Northwestern University Knight Lab. According to Tataranni, teaching the new class was a challenge. Over the course of three months, students learned a great deal about Chicago’s history and architecture, classical receptions, urban studies, and digital humanities. For some students, this was not only their first experience working with scholarly video, but video in general. In designing and delivering the class, Professor Tataranni partnered with the Multimedia Learning Center who offered a series of laboratory tutorials for her students on video recording, editing, and production, as well as sessions on data management and use of online storytelling tools. In total, the tour includes sixteen locations, eight of which have detailed video narratives. Professor Tataranni noted that there were many more buildings that could have been included in the tour, but that quality was more important than quantity. “We wanted to show the potential for further development without making the tour look poorly developed,” she said. The idea and design of the course took root during Tataranni’s participation in the 2014 Arthur Vining Davis Foundations Digital Humanities Summer Faculty Workshop. Additional development for the course was sponsored by an Alumnae of Northwestern for Curriculum Development Award (awarded by the Office of the Provost). For its part, the MMLC is delighted to see such an outstanding result and looks forward to continuing to support the course and similar class projects in the future.